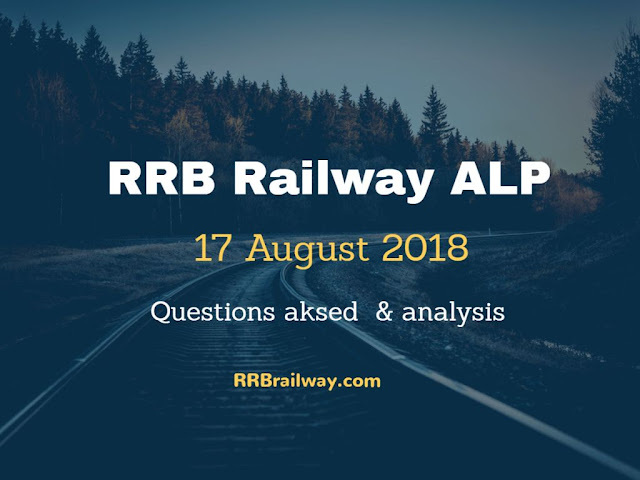 Hello Friends, we are here with Railway RRB ALP 17 August 2018 Analysis and Question Asked in Exam Download (All Shifts). You can check all the questions here. RRB ALP Question Paper with Answers 17 August 2018 – 1, 2, 3, RRB ALP 17 August Exam Analysis/Questions Asked Shifts 1st,2nd,3rd, RRB ALP 17th August Exam Analysis 2018 All Shift Memory Based questions. There were questions asked from general science & current affairs. Reasoning was easy for most of the students. Maths was moderate according to the students feedback. In General Science section there were more questions from physics and Chemistry. Calendar- If today is Friday. So, what will be the day after 30 days? Age - The Ration between the age of Ram & Radha is 1:2 & the sum of their ages is 87. Then what is the age of Ram? What number should we add with 435 to make it a square root. A is filling a tank in 2 hrs, B is a hole present in the tank. If both A and B works at the same time then it takes 7/3 hours to fill the tank. If the tank is full, then how many hours the tank will empty? Trigonometry - Sin 30+ Cos 30 + (Cos 30/Sin 30) = ? Sin A+ Cos A = 7/5, then Sin A -Cos A = ? Height = 14, Base = 7, Then find the Hypotenuse? Statement & Conclusion - No Orange is Mango, Some Mango is Apple. Number Series - 7, 13, 25, 49,? Trigonometry - If Sin theta + Cos theta = a, Sin theta - Cos theta = ? 123+ 0.123+ 0.0123 + 0.00123 = ? Rate = 4%, Amount - 1250, Time = 6 years, Find Principle? Calendar - If 12 September 2002 was a Sunday, Then 12th September 2003 was which day? Reaction between Caustic soda with HCL, What will be the products? What deficiency causes Blood Clot? What is seed made up of? Who is the Lok Sabha Speaker? Who won Ranji Trophy 2018? Where does President of India Ramanath Kovind bolng to? Who won Junior Hockey Championship? Who is owner of Delhi Dare Devil? Who is the owner of Mumbai Indians? We'll share questions as exam is over.